“Chinggis Khaan” in bright red neon affixed to the airport terminal is the first thing we see when landing in the capital of Ulaanbaatar – an apropos introduction to a nation that under Chinggis (1162-1227) and his descendants became one of the largest kingdoms ever recorded. Reaching its zenith in the 13th century Chinggis Khaan (who we in the west know as Genghis Khan) collected the tribes of the steppes, named them Mongols, and with an army of 100,000 skilled horsemen conquered the most powerful civilizations of the time (extending into today’s Russia, China, and Europe). His fierceness as a warrior was tempered by good – he introduced written script in the Mongolian language, religious freedom, and great wealth for the country, and sought to incorporate universal political and economic systems. Today he is a symbol of united strength, law and order to Mongolians. After stashing our bags at the Kharaa Hotel we walk down Peace Avenue, the main street of Ulaanbaatar (shortened to UB by locals). This crowded main thoroughfare is lined with shops, as well as vendors selling everything from apples to brown cedar nuts called “Samar” from sacks on the sidewalk, or even from the trunks of their vehicles. Everywhere I look locals are cracking these small nuts with their teeth like sunflower seeds, so I purchase a cup full, and although tasty the knack to readily get the nutmeats out of the shells escapes me. For our first lunch I eyeball a restaurant packed with local people (good sign of good food) and go in to check out the menu. No English. I am about to turn on my heel when a lady who has just finished her meal says, “Can I help you?” The two soups chosen by our helper are good indicators of Mongolians being heavy meat eaters. A mutton soup is like a stew with egg-sized chunks of mutton, and the only difference in the ‘vegetable only’ soup is that the chunks of mutton are smaller – both delicious! In Sukhbaatar Square our eyes are drawn to the regal Parliament House. At its centre is a seated Chinggis Khaan statue in bronze, guarded by two armoured soldiers on horses. 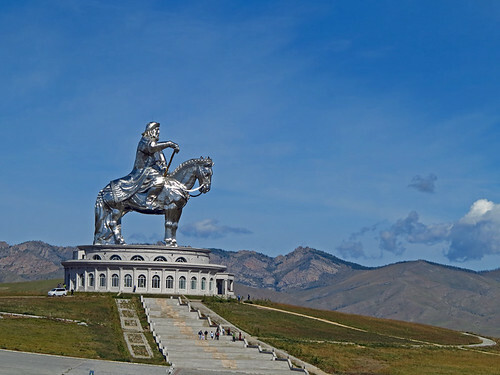 At the far west corner of the building is Chinggis’ son Ogedei, and flanking the east is Grandson Kublai. 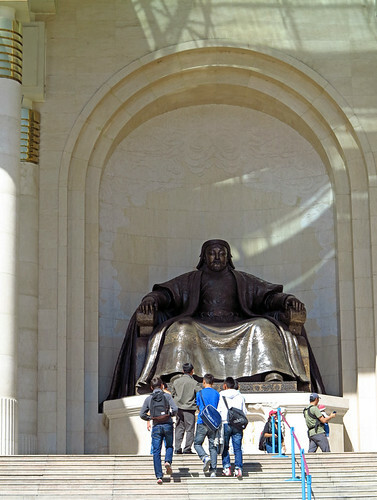 Rising from mid-square is a statue of Damdin Sukhbaatar on a horse. This “hero of the revolution” was the first to declare independence from China in 1921. The freedom from China was won with Soviet aide, which turned out to be only a trade for Soviet control and the capital being renamed Ulaanbaatar (Red Hero) in honour of the triumph; the Communist yoke lasting until 1990. Other interesting buildings that frame the square are the salmon-pink State Opera and Ballet Theatre, and the National Modern Art Gallery. Our shopping mecca is the State Department Store, a bland Soviet-style building on the outside, and six floors of everything one could ever need on this inside – like a high-end mall, including a gigantic grocery section (and “yay” a cappuccino café, for our daily eleven a.m. ritual…okay – addiction). It is bustling with the nouveau rich. The “biggie” today in the economy is mining – this land once stomped upon by dinosaurs is mineral rich and extraction is still in its infancy – gold, silver, zinc, copper, iron, lead, coal, uranium, molybdenum…the list goes on. Within the past two years the increase of people who can afford vehicles has rendered any semblance of traffic order nil. 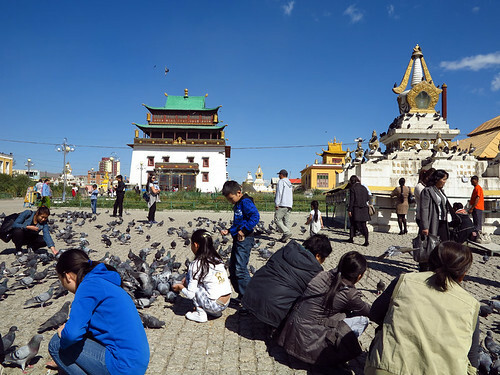 Ulaanbaatar’s population is now over a million resulting in gridlock of epic proportions. The single biggest tourist danger is crossing a street. Even when the cross-walk sign is on, cars turn almost on two wheels within inches between pedestrians. Traffic police attempt to control the flow at major intersections and crossing guards stand with signs on the sidewalk at corners (afraid to venture out on the street), but all are endeavouring to improve this chaos. 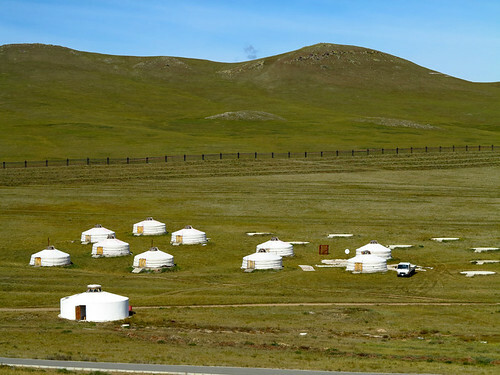 Mongolia’s terrain is mainly grasslands, with mountains to the north and west, and the Gobi desert to the south. Of the country’s 2.75 million citizens 30% are nomadic or semi-nomadic. 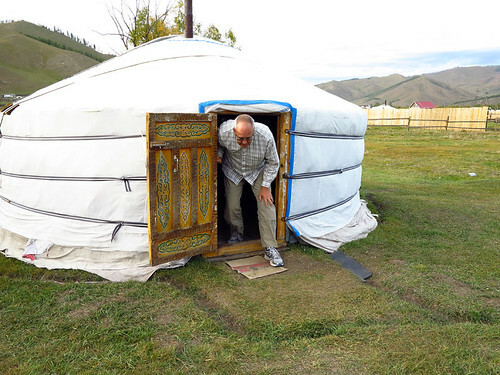 We decide on a steppe adventure and after checking out tour operators for our night in a ger (yurt) we decide on Tourist Information Center . Dorjo, who mans the desk, is able to answer all our queries and the center has a catalogue of tours specifying what you will see on each, along with prices. Undra our guide and our driver Sanjay are outside the hotel when we emerge at 9:00 a.m. Petite and cheerful Undra has a good command of English. Off we go towards the Chinggis Khaan Statue complex at Tsonjing Boldog – 54km from Ulaanbaatar. 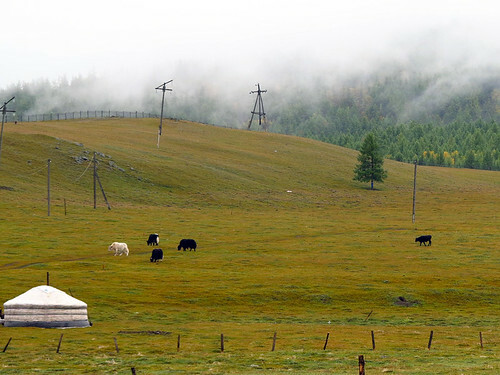 Out of the city and over a few hills the steppes unfold and seemingly go on forever, sporadically dotted with gers, grazing sheep, goats and cattle, or a lone rider silhouetted against the azure sky. The highways are dusty and rife with pot holes. Hmmm… potholes are not an apt description; some of these maws could swallow a small car. This has drivers continually swinging into the on-coming lane to avoid the pits, or to veer off onto the shoulder, and when the whole highway is blocked with piles of dirt with a sign sticking up in the middle, this means “detour” across grasslands and onto a side road with even bigger holes. We can only average about 30km an hour. Chinggis Khaan shines far off in the distance like a giant mirage under the halogen sun. As we draw near the gigantic 40-metre statue fashioned from 250 tonne of stainless steel rising from the top of the 10-metre museum/visitor’s centre is breathtaking. Astride his powerful horse the Golden Horde leader faces east toward his birthplace. He holds a gold whip in his right hand, which according to legend he found here before his rise to fame, considered a good omen for his future direction. As we climb the steps leading up to this behemoth, Undra says in her quiet way, “There are 36 columns around the base of the statue, one for each of the historic Khaans, from Chinggis to Ligdan Khaan.” This statue was completed in 2008, and the surrounding area will eventually contain 200 gers, arranged in the pattern of the horse brand used by the 13th century Mongol tribes. We come to the museum doors, only to find a hand-written paper sign that Undra reads – “Closed Saturday and Sunday – No Electricity”. Undra says, “this sometimes happens.” Oh no…we are not so much missing the artefacts inside, but would have liked to take the elevator up to the horses head where a platform brings you face-to-face with the mighty warrior. Oh well, that’s the way it is, and this does not in the least diminish the thrill of seeing this gargantuan art form. Onward to Turtle Rock which is in Terelj National Park with its high rock mountains, boreal forests of birch, larch, cedars, willow and pine. Stopping beside the popular rock Rick says, “Yup! Looks like a turtle”, while he focuses on finding the best angle for his camera shots. Another notable rock formation high on a cliff replicates “an old man reading a book”. This area is an outstanding setting for hiking, climbing, horse riding, and camping in pure fresh pine scented air under a canopy of blue. It is next over the rugged terrain (and by this I mean the highway) to Ariyabal Meditation Temple. As I gaze upward Undra answers my question still in thought-form, “The number of steps is 108; the Buddhist significance of the 1 – 0 – 8 symbolises “one – nothing – everything (infinity). Along the way are signs with 150 proverbs of complexity – as is the Buddhist way. 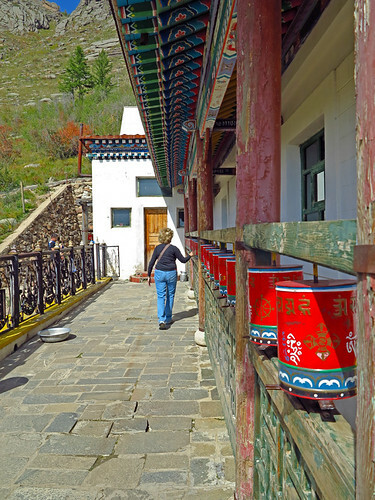 Towards the top of the hill we come to a platform with a 3-metre prayer wheel. We take turns spinning the wheel, and watching the pointer attached that stops like a roulette wheel on a specific number from 1 to 150 on the ceiling. This is the proverb that relates to one’s ‘now’ situation, mine is 111. From the wheel the path takes a right turn and I watch for this number. “It is source of suffering if one follows astrology alone.” Food for thought. The small meditation temple has an aura of tranquility. A golden Buddha looks over all from the back of the room, and 16 large vividly coloured paintings cover the walls. The middle of the room has rows of slightly raised carpeted areas, where monks would sit (if they were here). All around the outside of the temple are prayer wheels. We spin each and every one. At a suspended bridge; a sign reads “only four people at a time”. I think good karma is keeping it from collapsing as we wait for the bridge to clear from the dozen people giggling across on its thin boards. On the other side is a stone turtle with water trickling from its mouth. Sanjay quickly kneels down and drinks several fills from a convenient bowl at the edge. Undra tells us it is healing water, particularly for good eye sight. I dab a bit on both my lids. On the dusty road again we arrive at the small community and the ger where we will spend the night. 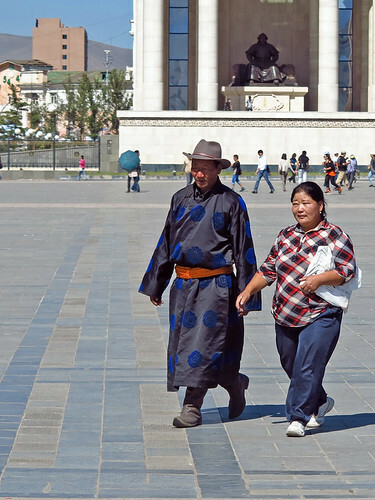 We see that here, like in UB, the del (traditional loose calf-length tunic with long sleeves) has been mostly traded in for western garb. It is now about two in the afternoon and after we put our belongings in our private ger, we go over to the main ger of our host family. Tradition and modernity are balanced in the nomadic lifestyle of today. A satellite dish stands like a sentinel outside, and inside is a flat screen TV and an electric washing machine, and Okto, the lady of the house, chats with her friend on a cell phone. We are famished, but not for long. Okto spoons out bowls of delicious hearty soup with mutton, cabbage, carrots, potatoes and noodles, plus buuz (steamed dough filled with minced meat and onion) followed by tea and some big thick short-bread-like cookies. We soon learn that all our meals, whether soup or a solid dish, are cooked in the well-worn steel wok that fits over the woodstove/ger heater. This wok is also used to wash up the dishes. Water is hauled from a community well a kilometre away. Our plan is to go hiking up a neighbouring hill, but the sound of galloping horses and cheering crowds draws us down the street to where a mini-Nadaam is going on. What luck! – since we could not be here for the National Nadaam Festival held annually on July 12th and 13th. Participants come from all over Mongolia to compete in horseriding, archery (once only for males, but now open to females) and wrestling (still only for the testosterone gender). Although we just missed the horserace, we did catch the five winners being honoured in the traditional way – a drink of airag (fermented mare’s milk), a medal, plaque and for the horse a splash of airag on his backside. The riders are young; one little fellow looks about 5 and a girl not much older. About 16 wrestlers move into the circle of spectators in pairs, the winners are pitted against winners. The fellow in traditional costume wins over and over, and each time he wins he raises his arms and soars like an eagle around the national flag to celebrate his victory. Only two participants left; I can see bird-man having his work cut out for him, as his opponent is taller with six-pack abs. This match goes on longer than any other, but somehow flamboyant blue-bottoms makes a quick clever move – and wins the competition. Shortly before supper Okto’s husband Dashdondog (Dasha for short) arrives home. He has a dynamic “presence” and a 200-watt-light-bulb smile. When Undra reveals he is a Shaman, I am somehow not surprised. He speaks little English but as soon as Undra mentions Canada, he says “hockey” and tells us through her about his fondness for the sport. His humour is contagious. He asks about our family, and keeps teasing us that he is the winner with two more Grandchildren than our six. I get a chance to ask about the spirits he calls down. Undra points to his well-used drum hanging from the ceiling, saying he brings the spirits down by drumming. She says when they enter his body they speak through him, answering questions or giving advise to those he is intervening for in the spirit’s voice, but later does not recall any of this. He says he deals with 77 spirits for their healing powers and wisdom. After a fine mutton, veggie and rice mix supper, Dasha goes out to start a fire in the stove in our ger, and wool blankets are placed on our beds situated around the walls. Other than the pillows being rock-hard the bed is fairly comfortable. We both wake up to heavy rain bouncing off the ger roof. We are a bit chilled after the fire goes out, and come morning we move at Superman speed to get ready for the day. It is still raining but we can’t postpone the 300-metre trek outside our ger compound to the pit-toilet (an outhouse facility six or more gers share). Of the two horizontal logs to pull back on the compound fence, we only put back the bottom one. Oops! By the time we return three calves have jumped the lower rung and are now munching on forbidden grass, and the race is on between us and two galloping mama cows intent on joining their offspring. We startle them with a holler, and they veer off. We call on Okto and Dasha’s visiting grandson to chase the calves back out. No horse ride today with the heavy rain, so after breakfast we begin a game of Shagai. This game is played with dried sheep ankle-bones, of which the four sides are given the names “sheep”, “goat”, “camel” and “horse”. When it is your turn the aim is to plink a specific animal against the same animal without touching another bone – for which you get to keep one of the two bones in the play. Only Sanjay and I have bones left when we clear the table for lunch, so a tie is declared. Dasha gets out his video camera for a farewell recording of us together. On the way back mud from the rain is added to the potholes, but the dust is down. Coming from higher elevation back into UB we see the capital from a whole new perspective – the roofs of the city are like a colourful patchwork quilt – red, blue, orange, gold and green. Dots of white are the many gers that are now intermixed with the other structures on the outskirts of town. We are tuckered-out but feel good about our special experience of spending time with such a warm and inviting Mongol family, that we will relive again and again. A cultural performance is on our list of things to do. The Tumen Ekh Song and Dance is held in a crumbling Soviet era building tucked back from the street. Fabulously costumed dancers twirl and leap and display much facial and hand expressions in a series of folkdances. Then an older distinguished gentleman of strong stature comes on stage – the throat singer! Called “khoomii” – throat singing is produced by the shaping of the throat, lips and mouth which results in a number of tones or pitches at the same time. He begins archipelago with a sound like no other, resounding and haunting; the growl of lower tones especially raises the hair on the back of my neck. The ensemble playing traditional instruments joins in. 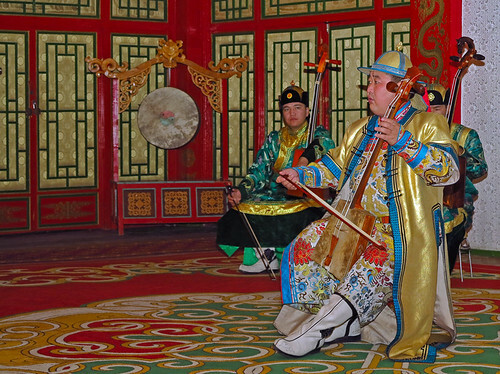 A musical piece with spirited tempo has solo portions from two talented Morin Khuur (Horse Hair Fiddle) players. The contortionist is superb, performing feats that seem humanly impossible. Rick and I concur this is one of the best cultural performances we have ever seen. 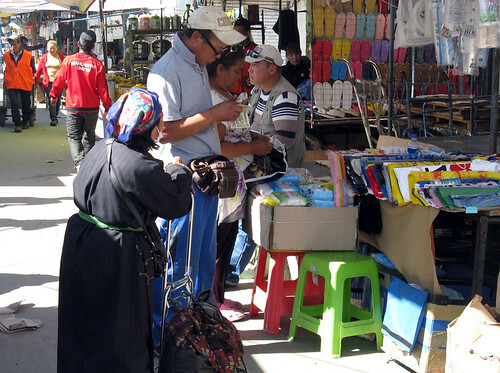 One morning we venture out to the Narantuul Market (known as the Black Market) – a 60 minute walk. The size of two football fields are filled with long rows of roofed stalls with clothes for every age, size and taste, from traditional to top designer knock-offs, leather goods, shoes, boots, luggage, purses, kitchen everything, rugs, ger furniture, saddles, and more. In a large metal Quonset-shaped building we find one side filled with all manner of cosmetics and jewellery, on the other side meat is being cleavered into chunks, all sorts of sundries, and baked goods that have us drooling. We purchase a coke and a big bag of cookies like we tasted at the ger, then hunt for a place to devour them… hmm, a shady spot beside one of the outside stalls will have to do. No sooner than we break the bag open than an elderly couple flops down on a newly purchased folded rug for a rest. I admire her bright lime green del and his taupe one with a marigold yellow sash as we share our cookies and smiles with them. Walking toward the exit I see men ladling a white foamy liquid into a communal bowl. I find out from a young lady that this is indeed fermented mare’s milk, which as yet I have not had a chance to sample. Well, I figure, its now or never. I line up in the queue and have the vendor pour some into my empty coke bottle. Hmm, creamy with a bitter rather sour taste – it is definitely an acquired taste. Another must is the climb to Gandan Monastery, well worth the effort. From 1838 it became an important learning centre for the entire Mahayana Buddhist community, with a dozen dastans (institutes) housing thousands of monks. In 1939, under communist suppression the temples of Gandan were destroyed or used to accommodate Russian officials or made into horse barns. After 1990 an ambitious restoration program began of its temples and institutes. All ages come to enjoy the serenity here, and to feed the mega-flock of pigeons with seeds purchased from little old ladies. Outside the city the land is timeless, its vast undulating steppes give a sense of infinity. 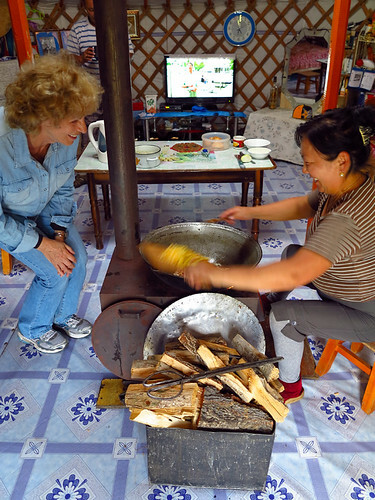 The Mongolian hospitality is so genuinely and graciously given out in giant dollops as to pluck at one’s heartstrings. This land of mystique frozen to foreigners for so long is now in a rapid thaw, and we will forever be glad we came. Our next stop – South Korea. Highly recommended! Just off Peace Avenue; close to major sites. Helpful English speaking staff. Clean comfortable rooms. Set breakfast of eggs/sausage/toast/+more – served hot from kitchen in the downstairs restaurant.